The music of Hilary Scott would not normally cross the pages of Dangerdog Music Reviews. A talented multi-instrumentalist and singer-songwriter, Ms. Scott's style blends elements of melodic folk, soft rock and country which may be more suited for Nashville or Memphis than our hard rock and heavy metal halls. 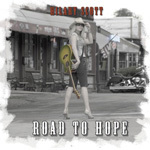 Her latest work, Road to Hope is disc of original songs and covers. Within, Ms. Scott can remind of Alanis Morisette, Tori Amos, and sometimes Sheryl Crow when she rocks a little harder (which is not often). Ms. Scott's strength is a perfect balance between fine song composition skills and a terrific voice which displays great range and versatility. I had my doubts when I saw Leonard Cohen's Hallelujah on the track list as this is a legendary piece from him. But Scott pulls it off with some skill and passion. Another cover Ms. Scott attempts is that of Bob Dylan's To Make You Feel My Love from his 1997 Time Out of Mind. This song has been covered about a billion times by artists as broad as Billy Joel, Bryan Ferry, Joan Osborne, and French singer, Emily Loizeau. As expected, Scott brings nothing new to this song, and should have probably picked something from earlier in Dylan's career. Covers aside, Hilary Scott, her talents, and her proficient band are best represented on her own compositions. Her vocal stylings are deep and emotional on songs like Loser Blues and All Along. Songs such as Daydreamer, Sugar Bomb, and Road to Hope show Scott's songwriting maturity as she eloquently evokes melancholy and brightness. Often, as I listened to Road to Hope, I was reminded of discovering Mary Chapin Carpenter and her State of the Heart album back in 1989. I believe Hilary Scott could be equally as profound as her career expands with some recognition. Though not fitting the hard rock and heavy metal context of this review site, Hilary Scott's mixture of soft rock, folk and country on Road to Hope displays her exceptional songwriting skills and her beautiful vocal stylings reminding me of early Mary Chapin Carpenter (and that's a very good thing).